Hello, everyone. I'm Andrea and I'm going to be your reporter for this week. Today we, the Italian Editorial Board, will fly to Romania in order to take part to the 16th EPMeeting. It will be held in Brasov, the first two days, and then it will continue in Fagaras. Everyone was exited before the departure for this imminent meeting with peoples of other nationality. 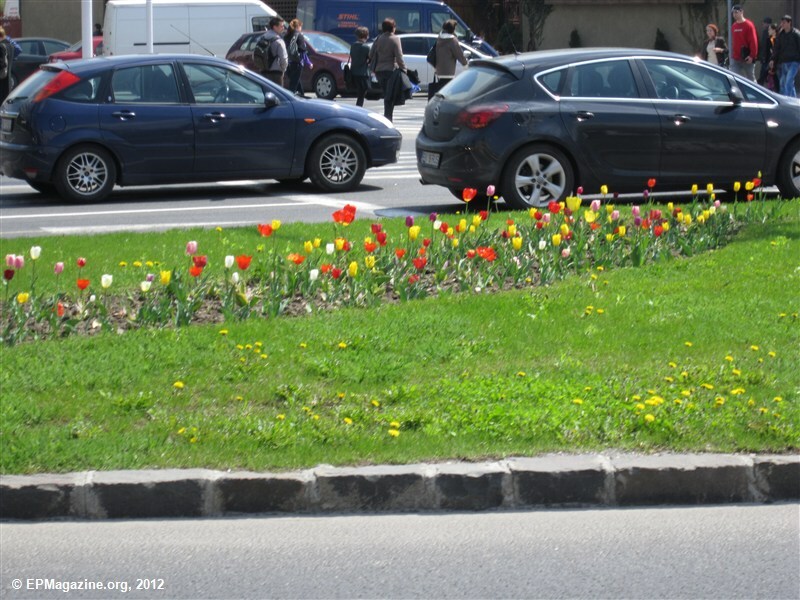 We arrived in Bucharest in the afternoon and then we went to Brasov by car. The weather was not too bad, the sun was shining; I expected a cloudy weather without a single ray of sun, but my expectations were wrong. Finally we arrived at the University of Brasov in the evening; we visited part of the building and then we went to the dormitory. Good morning, everyone. How do you feel today? Today we are going to start our talks, which we have prepared a few weeks ago. First we went to have breakfast in a fast food with sandwiches and tea. Then we went to the University Library to open the meeting. After the welcome speech we started with the presentation of the talks as you can see in the EPMeeting Program. Everyone has talked about a different subject, about own nationality, EPM or something else. 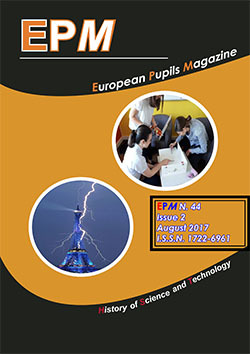 We started with the presentation of the participants’ schools; then we continued with the talks about the past of EPM, like the topic from Kastamonu to Brasov-Fagaras on the work done and not done since the last EPMeeting, and present, like the official site that you’re using at the moment. 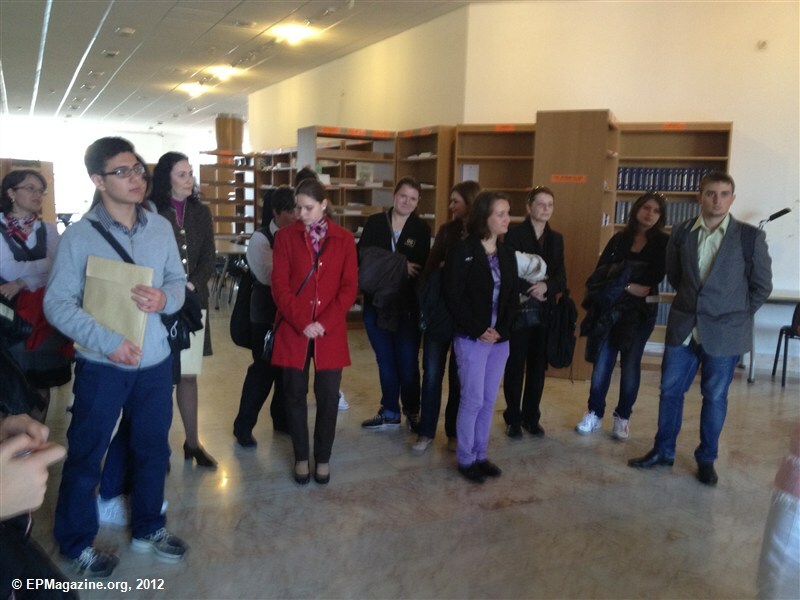 At midday we visited the library: the reading area, the main room for the conferences, the printing factory, and so on. Then we went to have lunch. After that we took a bus to reach Mircea Cristea High School, where we continued with the talks about the managing of the issue, like how to write an article and how to paginate it. Finally, we visited the building and returned to the dormitory. For dinner we all had a pizza that poisoned everyone. Will we survive until tomorrow? We’ll see in the next episode of the EPMeeting Report. After having a sleepless night, we decided not to have breakfast with the rest of the team and go directly to the University Library. We started the talks about history of science and technology, and then we continued mixing them with some talks left from yesterday about Green Energy. Finally we concluding with the future of EPM. So, we talked about innovation of technology during the time and about food, like history of gastronomy, and renewable energy in Romania, like geothermal energy or aeolian energy. In the topic about the future of EPM we talked about EPMAward, if it is better to continue it, modufy or stop it; a new possible layout for the EPM CD Collection 2003-2012, and the issues of 2012; the next EPMeentig in Catania, to celebrate the 10th anniversary of EPM and finally the last talk about the spearing of Editorial works thought the different Editorial groups and cooperators. After finishing the talks we went to CEASU’RAV restaurant and had grilled chicken breast with rice and mushrooms. 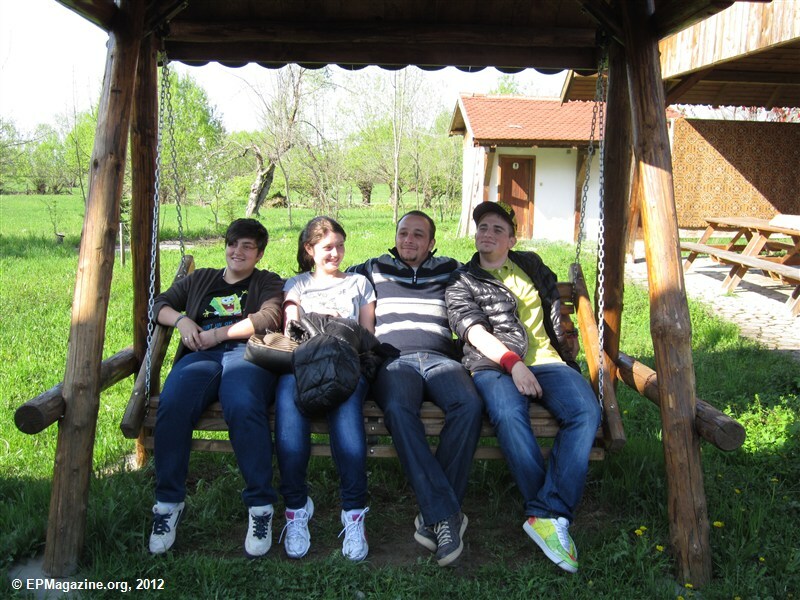 Then the Italian group returned to the dormitory, while the Romanian group decided to visit a museum in the city. Around 4:30 pm we left Braşov to reach the monastery of Sambata where we will redo all the talks for the new Romanian groups. We had a great dinner and visited the perimeters of the monastery; we have seen a lot of frogs jumping on the roads J. Finally, here we are writing this report of this long day. What will happen to us tomorrow? Stay with us and don’t change the channel! Today, Wednesday 25th April, we started the day very well with a splendid breakfast of bread and butter with various spreads and tea. After breakfast we left the monastery to Dragus School in Dragus, a town near Sambata. Here we visited the school and a small museum of a typical house of Fagaraş; we also dressed in some typical costumes. Then we returned to the monastery and we visited the library, with over 70.000 volumes about everything, and the icons museum, with different religious paintings. After lunch, vegetable soup, salad and rice with mushrooms, we restarted our conferences with the talks about the schools. We haven’t redone all the same conferences because this time there were new students of new school, so we have known new schools, new projects and new fun news. Then we continued with the talks about past and present of EPM, with the works done and not done from the last meeting, the official site that you are actually using and the special talk about Antonino Porto, concluding with some talks about history of science and technology, with some talks about Romanian inventions and inventors. Finally we had dinner with fish and potatoes. So, at the end, this long day is finally over. What will we eat tomorrow morning? This is what we are all pondering about. We started the day with a nice, cold trip to Voila hydroelectric plant where we saw the electricity generators and their functioning. During our trip there was a blackout; so the generators stopped working and we were led out of the power plant. After this small shock, we went to Doamna Stanca High School to start today’s talks, starting from the Green Energy talks. The most important talk was about how Voila hydroelectric plant was built and their work of decontamination of the Olt River, but also the topic of geothermal energy in Romania was important. Then we visited the school and had lunch in another one nearby. After that, we continued with the topic how to manage an issue with the talks about how to write an article and how to paginate it, and finally the management of all the issue. Those have been very important talks because in this way people, who have worked on a issue, have had the possibility to compare their work to how they should do it. Finally we had free time which we spent in Lisa, where we have assisted to some steps of the making of woolen carpets, and on the mountain, where we took the wrong way and found a dead end. We had dinner at the monastery and then we concluded the day working. How will the meeting end tomorrow? Hi, I’m Laura; I’ll be the reporter for this time. Today was an important and wonderful day for me because after five days of the meeting I met and spent some time with other people and I presented my talks in front of them. After that we visited a nice park where there were some horses, we saw both female and male horses; the male were in the stable while the female were free. They were really beautiful, but I didn’t like to see the animals closed in stable, I prefer to see them free to run on the grass. Then, we went to visit a nice school in Fagaras, it is the best school I’ve seen until now. It is big and in it there is a beautiful garden which is kept by the students, but the thing I liked most were the pictures of the students playing with the teachers. They look like friends; I think it’s really nice! During the visit I talked with some students that knew how to speak Italian! I like so much the students of that school, they were really kind. I hope to meet them in Catania in the next meeting! After that wonderful experience we presented our talks, I was really scared because I’m very shy, but at the end I did a nice work. The most important thing is that our new entry, Luigi La Magna who is the youngest of the group, made a wonderful lab where he explained how to program in HTML; we were really proud of him! Later we visited the Fortress of Fagaras and then we left for the University of Brasov and had dinner with the Romanian group in the best restaurant of Brasov, CEASU’RAU. I love this meeting and I really like the people I’ve met. Here I am again. I’m Andrea and I’ll start reporting again, because I didn’t feel very well last day. So, today we will conclude this long meeting talking about the future of EPM and our program until next meeting; this is also our last day here in Fagaras because in the afternoon we will leave to Brasov. First of all, after the usual breakfast, we packed our things and said goodbye to the monastery. It has been very sad because we spent a great time during our stay in it. 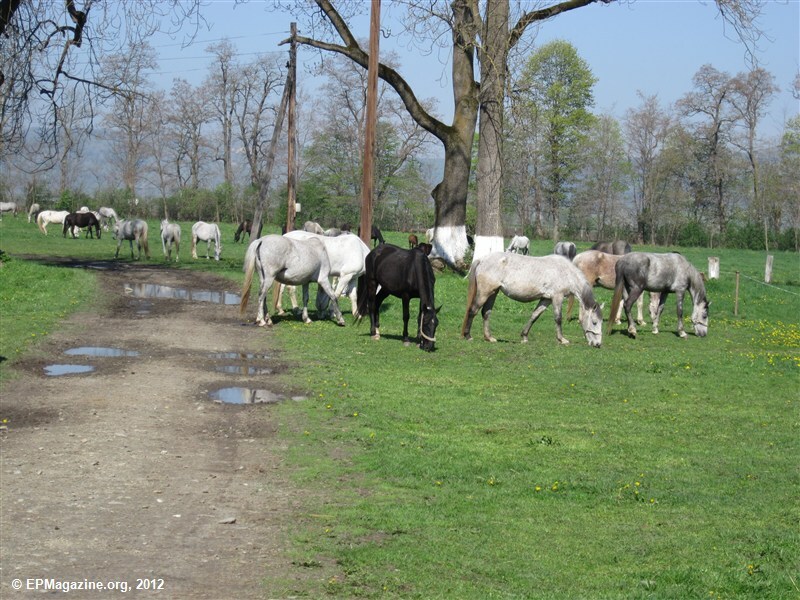 Then, we went to visit Negru Voda Cultural Foundation where we have seen how they grow their male and female horses; it was a pity that we hadn’t the possibility to ride one of them, but we happily saw a young horse running around: it was the first time out for him. After that, we reached the school where we started the last topic: the future of EPM. We talked about the future of website with Giovanni’s site; the future of EPMAward, with the problem about continues it or stops it because of economical problem, and next EPMeeting in Catania to celebrate the 10th anniversary of EPMagazine; new layout for the CD and the issue and the last programs discovered in order to facilitate the Editorial work; and finally the most important talk of the day: from Brasov-Fagaras to Catania where we have speared the Editorial works into the different Editorial groups and the cooperators. Finally we can close this long meeting saying that we have to be proud of what we did until now and that we can and have to do a lot of new things for our Magazine, for us and for all the people who are following our Editorial work. And then? Well, after we visited the fortress of Fagaras left to Brasov. Before we left Fagaras, we visited the ASDF association who has recognized our work useful for people and has contributed to our cost of the journey. I hope they will continue to sustain our spreading work of EPM all over the world. So the meeting is finished, but we won’t leave until two days. What will we do until our departure? Good morning world!!! Finally we can enjoy furthermore our stay in Romania; in fact now haven’t got any talks to present of works to do, expect for me since I have to do the reports. But is everything really over? NO! In the afternoon a new group of Romanian will come to Brasov and we have to show them EPM and its features. So, let’s forget of it for now and let’s enjoy our trip to Poiana Brasov. After breakfast, we visited the ethnographic museum of Brasov where they explained us the development of the technique to make carpets and clothes. We had also the possibility to see a mechanic machine working and making a lot of different shapes of carpets. Then we visited Poiana Brasov, is a very large park; during our walk in the park we have seen a politic man doing his speech to a lot of people, but we didn’t understand anything, of course. After lunch we prepared a short talk about EPM and what we did in the meeting. Thus, we presented it in the afternoon. Finally, there has been the consignment of the diploma, followed by the farewell dinner, with certain sweets, food and tea. Here we are! The last day in Romania has arrived. How would we spend today’s time? GO KARTING!!! Yeah, exactly! Go Karting. We decided to spend the morning going to a close area where we could go karting in a track, and it was the first time for the most part of us. So, after breakfast, we took a bus to reach the track and start our race! Don’t miss our pictures about it! It has been very fun and exciting for all of us, also for Vittorio despite feeling a bit bad after the race. Then, we went to visit a supermarket and buy something. After that we joined with Ms. Crina near the center and went to have lunch. We searched a lot for a cheap restaurant near there and, when we found it, we understood why it was cheap: we waited one hour before they brought what we asked. Finally, we visited the market opened 24 hrs a day and bought something for dinner. Tomorrow we will leave to Catania and return home: how will we fell tomorrow? Will we fell homesick or will we miss Romania and its People? One think is sure: no one of the Italian group will miss sparkling water. Departure time. It’s finally arrived the time of departure for Catania. What can I say about today? Nothing of really important, because everyone feels in a different way. I think that all of us feel homesick, but a lot of us don’t want to leave Romania as it occurred in Turkey, but home calls. After last goodbyes with the Romanian group, we left Bucarest flying over the sky to Catania. This has been a long and intensive meeting full of important new things, fun and new friends. Thank you for reading my reports, I hope they haven’t bored you too much, but they have created in you a fire that burn for the magazine and the meetings.